Having a deadline is never a good idea on a sailing holiday, but despite extending my trip to compensate for the delayed launch of the boat, my pet sitters were getting restless (as well as increasingly expensive) and I had commitments, so a flight home had to be booked. 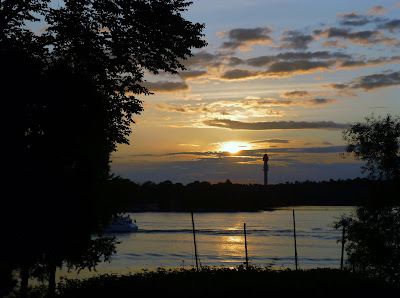 We decided on Helsinki for my return flight as my husband, who was planning to stay on for a couple more weeks, was keen to carry on to Tallinn in Estonia, so Helsinki was en route for him. However this involved the serious business of 'making passage' rather than the idyllic island hopping we had been enjoying. It took a long day's sail in the Finnish Archipelago to bring us to the island of Juomo, and we arrived, tired, around 5pm to find a full harbour with no available moorings and a strong wind making moving on difficult and potentially dangerous. This was a situation which required ingenuity, so we did something we hadn't tried before which involved literally poking the boat's nose (bow) between the sterns (rear) of two boats already moored up, and tying onto the middle cleats of their boats. This meant that to actually get off the boat onto the island we had to clamber across our German host boat, placating them later with a glass of Single Malt Scotch whisky, which went down well! The next morning started badly, with the Germans knocking us awake at 7am on the dot (5am English time), followed by a trip to the heavily overused compost loos with no hand washing facilities - no running water on this island - then another long, windy day at sea, with the sails up, mostly stuck on a port tack (heeling over to the left, the sea washing our deck) which makes doing anything at all hazardous and tricky. Even the kettle was on the floor, and I had a splitting headache! A toxic combination as I really dislike any sailing that involves needing to strap onto the boat but sometimes it just is like that. Definitely a 'Should have gone on a Mark Warner holiday' meltdown moment. 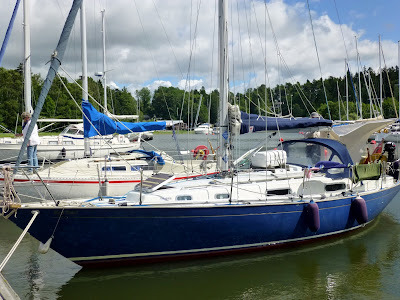 Our next stop at Rosala was pretty much the equivalent of a motorway service station but it was relief to me that, with very little wind the next day, we were motoring, not sailing and more or less upright. Five hours later we arrived on the Finish mainland at the charming seaside town of Hanko, where we decided to stay for a couple of days. I could get the train from there to Helsinki and I was pretty much at the end of my boat tolerance. Time now to relax and enjoy a final weekend in Scandinavia. This is how we get on and off the boat, stepping onto the plank tied across our bows - in England small boats are usually moored alongside a pontoon, but the rule is 'bows to' in the Baltic and Scandinavian boats have an opening at the front, like the next door boat, but not ours. You literally have to take a deep breath, step onto the small space between the ropes holding the plank before you can grab hold of the stay. I don't know what Health and Safety would have to say! 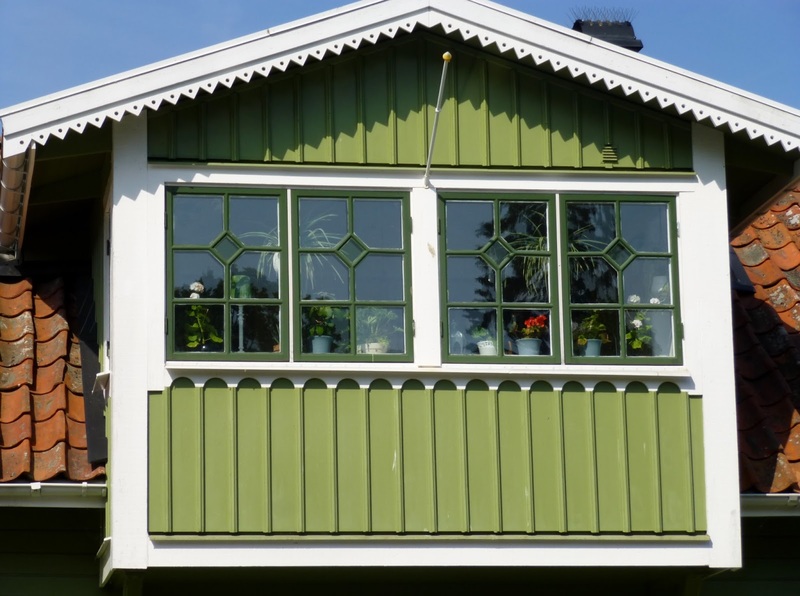 Hanko is a former spa town and has been heavily fought over with Russia, but it has been left with a legacy of beautiful villas and almost deserted beaches. The light there is magical and it is an attractive venue for artists and musicians. We loved exploring this unexpected and unusual town with its almost empty beaches, boutiques, bars, restaurants, hotels and delis and I quickly decided that package holidays can wait. This was so special. The weather was overcast when we arrived, but we still found the evening light created a haunting atmosphere on the beach. 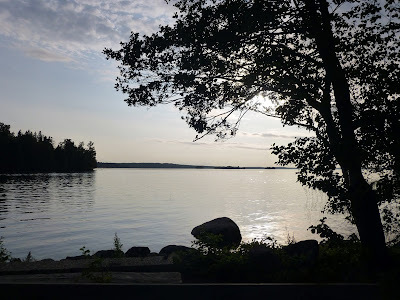 On our second evening in Hanko we went for a walk around the town after a boat supper and heard the most stunning live music coming from the hotel on the beach and had to investigate. Playing in the courtyard were a professional Finish guitarist and his Belgian wife. She had the most beautiful voice and they were performing a cover of Chris Isaak's Wicked Game to a small and very appreciative audience. Sadly, they were just about to finish when we arrived, but we discovered they were playing again the next evening (my last) in another small venue on the harbour side. It was a superb evening and despite knowing we had an early start the next day, and I had two long days travelling in front of me, we stayed right to the end, falling into our berths at 2am. After all, you only live once. The next day, it took two trains to Helsinki, another to the airport, a four hour flight back to Gatwick, a train and taxi to a friend's home in South London for the night, then several more trains the next day, wishing I hadn't got such a large bag to trail behind me, and finally home to Suffolk. Addendum. 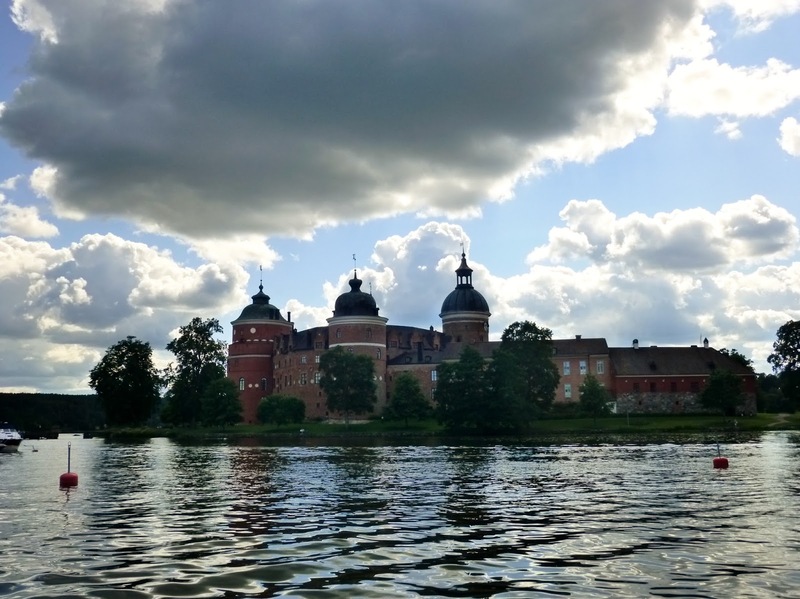 We were sailing in Scandinavia in July and early August. Although the summer days are long it quickly becomes cold after mid-August and most boats are tucked away by then. It was already cold at night when I left at the end of July and we were glad of hot water bottles and duvets! Sailing in a small yacht is always an adventure, full of unpredictable highs and lows, often both in the same day. Every day is different and as we release the mooring lines in the morning we never know quite what to expect. Although there is always a moment when the combination of fear and sheer discomfort becomes quite overwhelming, and I resolve 'never again', still I go back for more because there will equally be moments of the sublime and the magical that cannot be found in any other experience. I understand what my husband means when he says that sailing makes you feel fully alive and I often feel we live more intensely in the relatively short time we spend on the boat each year than at any other time when life is more humdrum and predictable. 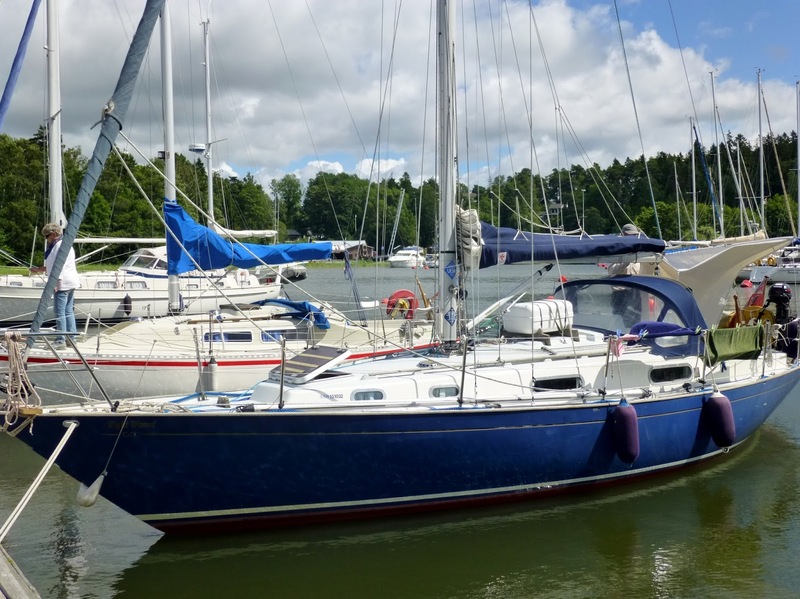 From the boatyard, we slipped downstream to the West Harbour in Mariehamn and celebrated the successful launch of our boat with a supper of delicious fresh fish and a glass of cold white wine, setting off for the island of Rodhamn the next morning in good spirits, the sails up as the wind freshened. Things got rather sticky as we approached the island though, as our new head sail refused to furl in frisky seas - too much sail for the weather conditions is always a bad idea and it took ingenuity and quite a battle to get it to collapse in a heap on deck so we could enter the harbour and squeeze ourselves into the tiny space which was all we could find, offering entertainment to the safely moored up boats. One or two other boats also arrived with collapsed sails, so at least we didn't need to be too embarrassed, although we both seemed to have forgotten everything we know about a well prepared mooring, sails and ropes in all the wrong places! 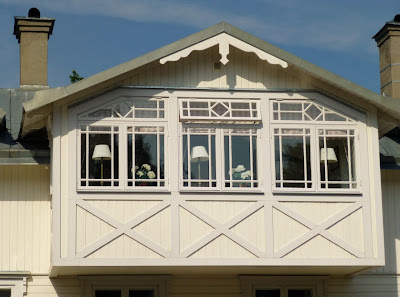 Rodhamn was delightful and the weather the next morning was positively Mediterranean, so we enjoyed exploring this small island, sitting outside the tiny cafe drinking coffee and eating the best homemade Kanelbular (traditional Swedish cinnamon buns) we have found in Scandinavia. Unfortunately, despite adjustments before we left, the new sail still refused to furl as we approached the island of Degerby a few hours later, so lots more undignified flapping, but lunch at the harbour restaurant soon compensated for the problems and as the weather was about to turn with heavy rain forecast, we settled in for a rest day, exploring the island in between rain showers, chatting to the friendly locals and wrestling with our overfull bilges. 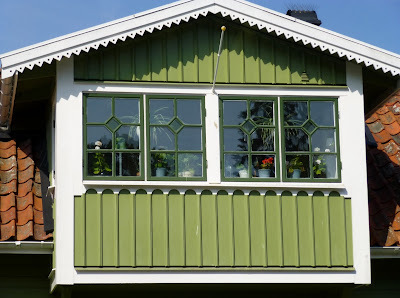 The next day was my husband's birthday and things started well, motor sailing through the Aland archipelago in bright sunshine, but as often happened, the wind picked up later and we had to divert from our intended destination of Kokar to the not particularly prepossessing island of Sottunga which is vying for the accolade of having the worst facilities in Aland, including a shower that had to be prepaid but, despite my best efforts, still ran out halfway through my hair wash with no more 2 euro coins to buy more warmish water. I ended up rinsing out the shampoo over a tiny basin with only cold water. Not the best place for a birthday celebration, but the next island more than made up for it! The wind was having none of our plans to visit the island of Kokar in the south and blew us North to the Island of Baro, which just happened to have an excellent restaurant, the Glada Laxen, overlooking the harbour and which was compensation for a rather disappointing birthday. The rest of the day was spent exploring the island and watching the children playing in and on the water - Scandinavians have a much more relaxed approach to water sports than the English as water is so much a part of their culture and the children grow up learning to manage their environment safely. 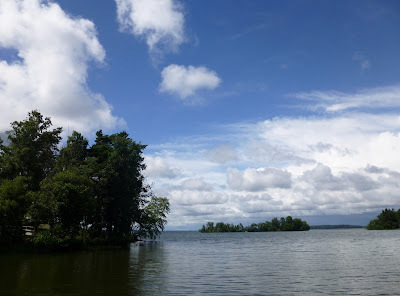 At last the wind was blowing where we wanted to be, and we set off for the popular holiday island of Kokar in limpid conditions, blue skies and impressive clouds. Half of Helsinki seemed to have the same idea and the island was teeming with families, camping, sailing and playing in the cold Baltic sea, but it was a good place to spend a couple of days, catching up with laundry, hot showers and time to explore before leaving the Aland Islands behind and heading towards the coast of Finland. Sailing is a frustrating business! Conditions are rarely favourable and it is frequently impossible to actually go anywhere in the boat at all, even in Summer, as the sea is too rough for any but the most intrepid or foolhardy. Either the wind is in the wrong direction, or there is too much of it, or too little, or the tide is against us - although this doesn't apply in the Baltic - or it is tipping down with rain, but every now and then (a bit like Goldilocks) everything is just right and you have a perfect moment, actually lots of perfect moments out on the water, seeing the world from a very different perspective and often almost completely alone. Compensation for dawn starts, unpleasant, crowded airports, snaking queues and tortuous journeys to be here! 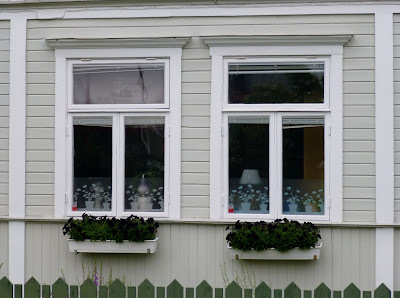 However, the last two gorgeous Baltic summers of cockpit living, the sun shining almost every day, the weather lovely and hot and firmly stuck in the 'Baltic High', had not prepared us for this difficult and extreme summer. It started well enough and the first few days were hot and sunny but the weather quickly deteriorated. Every day could be both hot and sunny and cold and very wet indeed at any one time and weather forecasts proved to be extremely unreliable. Living in a very confined space when torrential rain is drumming down (and trickling down the mast which runs through the cabin) despite our best efforts to seal it, and dripping gently through the window onto my berth where I sleep with a towel and a bowl beside me to catch the drips) and with nowhere to dry wet clothes, unable to go anywhere until conditions improve, is not the best fun. We are after all basically camping on the water. Then there is the loo situation! On-shore facilities are often pretty basic and can be downright unpleasant and inadequate and forget privacy! 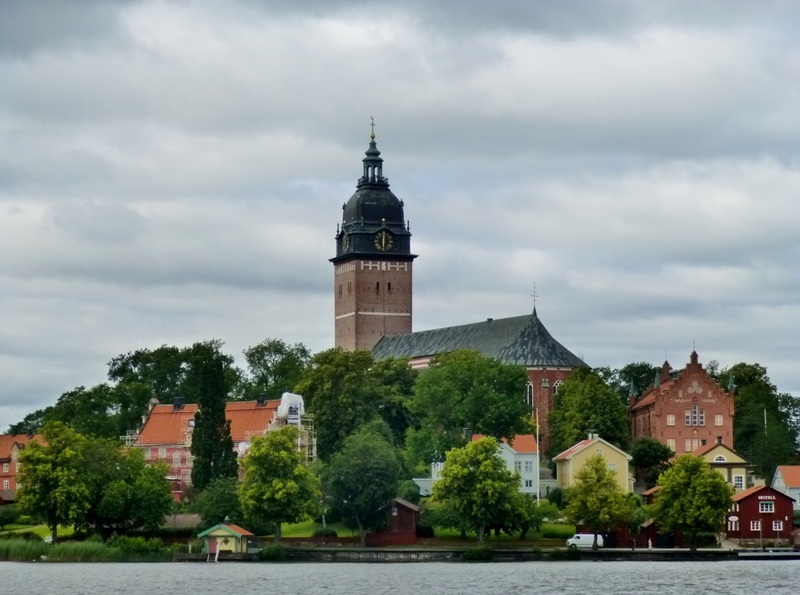 In Scandinavia, I quickly learned to strip off in the open showers and just get on with it. Everyone else does! Shower curtains more or less disappeared as soon as we reached Sweden. We arrived on one island in the Archipelago, successfully moored onto the rocks and were directed to the facilities which turned out to be a compost toilet, a 10 minute walk away through a swamp. What they didn't tell us was that no-one actually walks there, they all dinghy there, but we naively set off along a very overgrown path, slipping on wet rocks, sinking into bogs and under attack from ecstatic midges. I was badly bitten on my face and hands, the only exposed parts of me, and pretty traumatised. We left shortly afterwards to find a more civilised spot with an easy walk to the facilities and no midges. Mosquitoes though are a perennial problem on the water, particularly the lakes. Another low was the day we motored across Lake Malaren to Strangnas - a charming lakeside town -starting out in glorious sunshine, anchoring in a quiet bay for my speciality boat lunch of feta cheese and couscous salad only for the skies to turn ominously black by 4pm leaving us motoring through torrential rain, thunder and lightning for two hours before arriving soaked in harbour to find it was full on a wet Wednesday! Luckily they managed to squeeze us in eventually - we are quite small and that can be an advantage - and we had a memorable outdoor supper with new friends Eva and Pieter under canvas at the crowded open-sided harbour restaurant, the rain still tipping down in sheets and running through the streets like a river, still dressed for warmth in our foul weather gear. The glamour of it all! 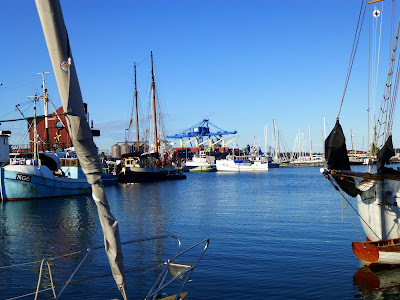 But there were some very special moments too, some beautiful remote bays to anchor in, some stunning skies and sunsets, delicious meals sometimes with live music, chance encounters with charming and friendly Swedes and some very pretty towns to moor up in and visit too. I could easily fill the boat with gorgeous Swedish design and love browsing around the antique and interiors shops, stopping for a cup of invariably excellent coffee or ice cream and a delicious lunch of fresh fish and salad before admiring the lovely Lutheran churches found in every town. Sweden is not having a good summer this year. For us, living for three weeks on a small boat when the sun plays hide and seek, the rain comes down in torrents and it is frequently cold and windy, is far from ideal. 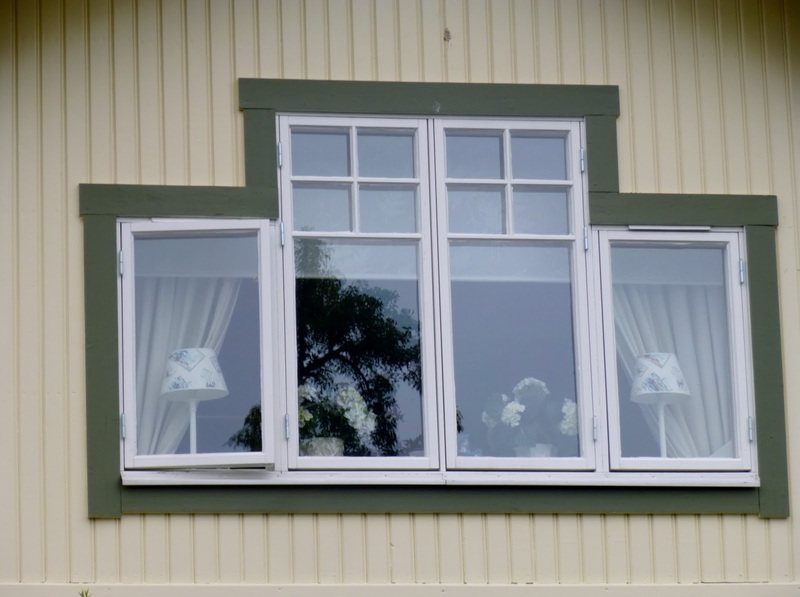 However, I have amused myself during the gaps between storms, wandering around Trosa, a very pretty town in the Archipelago, taking photos of pretty Swedish windows. 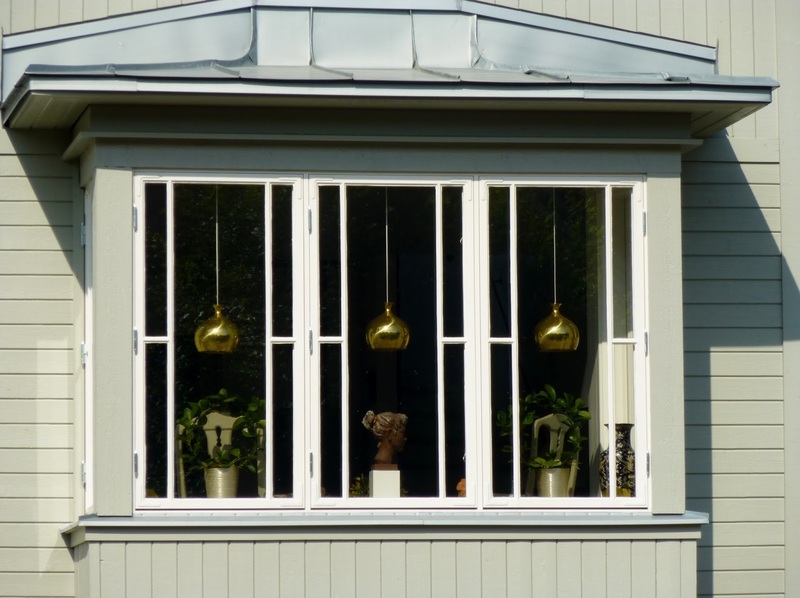 The Swedes certainly know how to dress a window beautifully! It was a chance meeting with Arno and Gita, a tricky mooring and a vicious tree attacking my partner as he helped them tie their boat up next to ours on the rocks at Ringson (followed by a compensatory gin and tonic on their boat) which led us to Trosa, a very pretty little town with a strong New England feel. 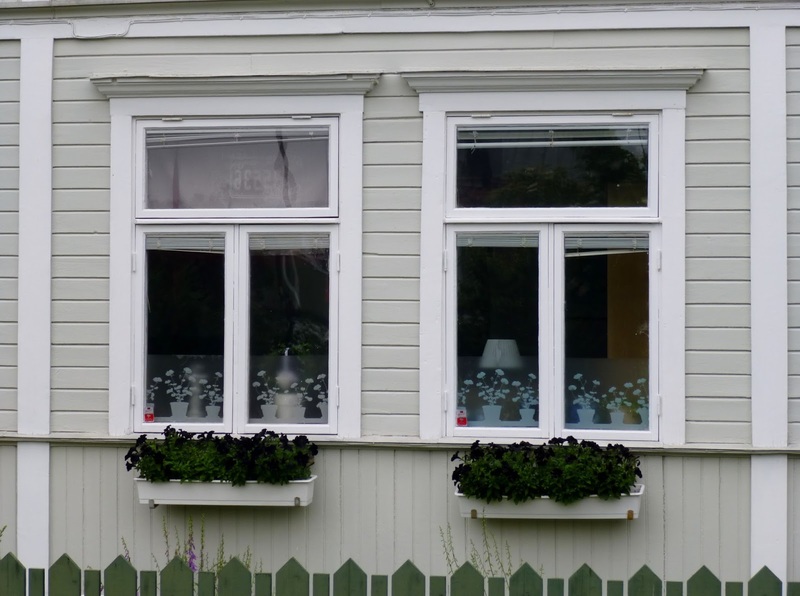 I think you can really see how Swedish style influenced building in parts of North America. This gorgeous house reflects its surroundings, the light green of the roof tiles picking up the light green of the larger tree, while the colour of the railings and the small tree in the front garden are picked up by the window frame in the eaves, all sitting tranquilly beside the river. 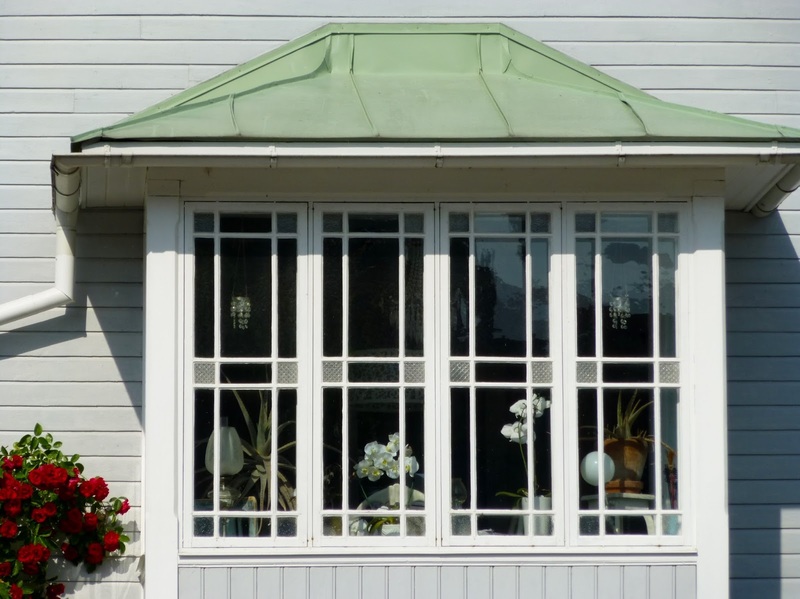 Our favourite cafe, Kutter Konfect, which serves delicious coffee as well as hand-made marzipan and truffles. The Swedes love their coffee and the quality is very high - a lovely, mellow flavour and just the right temperature. We never had a bad cup of coffee in Sweden - a real pleasure. I love the skies in Sweden, especially the evening skies just before the sun sets after a long, long summer's day. It is rarely dark before 11pm and light starts creeping into the skies again by 3am in June/July, which I found rather unsettling. I don't think we really slept deeply at all. 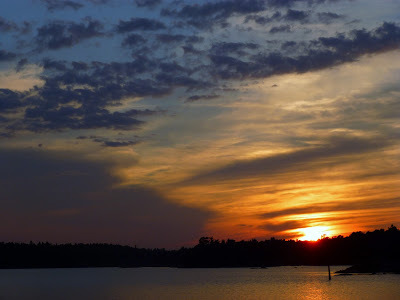 We dropped anchor for the night in a quiet inlet before heading to Fyrudden, a small pretty harbour, just a shop, a bar and a few houses, then on to Arkosund and a pretty sunset. We found ourselves caught up in a Swedish music quiz - we didn't understand the questions, never mind having the answers. We did, however, manage to score one point - probably the answer was Abba! Next stop was Nykopping marina where we could have showers and catch up with the laundry. Luxury! 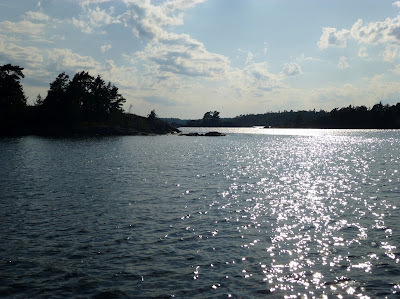 Then on to Ringson, an island in the Stockholm Archipelago where we learnt to moor onto the rocks, very popular with the Swedes, as you can then hop ashore and light a barbeque, walk the dog etc! ... before heading for the marina at Trosa, a beautiful little riverside town with a New England feel where we stayed a couple of days before a long, so very hot day motor sailing which brought us to the beautiful island of Rastaholm on Lake Malaren, our favourite place of all, I think. Just idyllic! 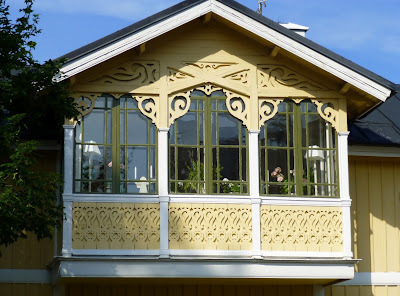 But we had Stockholm on our minds and the chance to sail into this stunning city, admiring the gorgeous Swedish summer houses built on the water and a chance encounter with Andreas, a lovely German who had hit a rock (a common occurrence in the Archipelago) and who needed a tow into Stockholm. We took his line and towed him for 2 hours - 4 tons of metal just behind us, and no brakes, negotiating a lock, a bridge opening and heavy boat traffic coming into Stockholm. We made it safely into Vasa Harbour in Stockholm, where we were found some scarce space - city harbours are popular in summer, but a crippled boat will always be a priority, and we ended our journey back where we started with an unlooked for extra two days in Stockholm, packed tight in Vasa harbour... with an invitation to a wedding in Germany very soon! "Not another cushion!" he grumbled as I clambered onto the boat carrying yet another shopping bag. 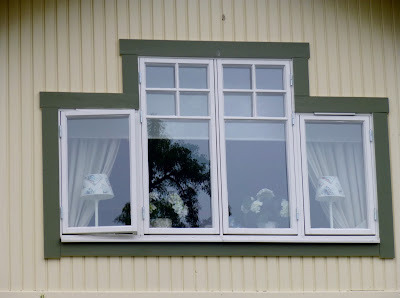 Inspired by our visit to Millesgarden and Svenskt Tenn, I was a woman on a mission and the boat was getting a Scandinavian makeover. Out with the drab and the utilitarian and in with the bright, bold and stylish. 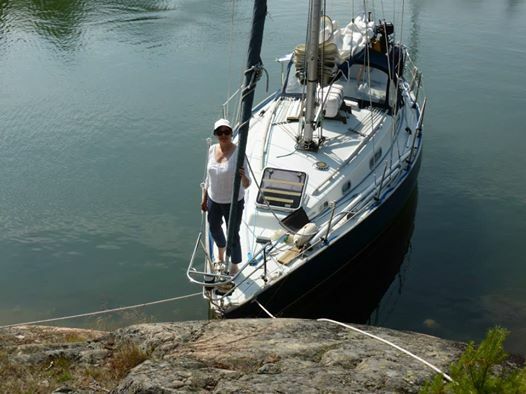 If I have to live on a small sailing boat for several weeks every summer, it is going to be a place I enjoy spending time! Cushions, duvets and curtains have gradually crept onto the boat over the past few summers, every change hard-fought, but now was the time to seize the zeitgeist and introduce colour. Glamping on the water has arrived! 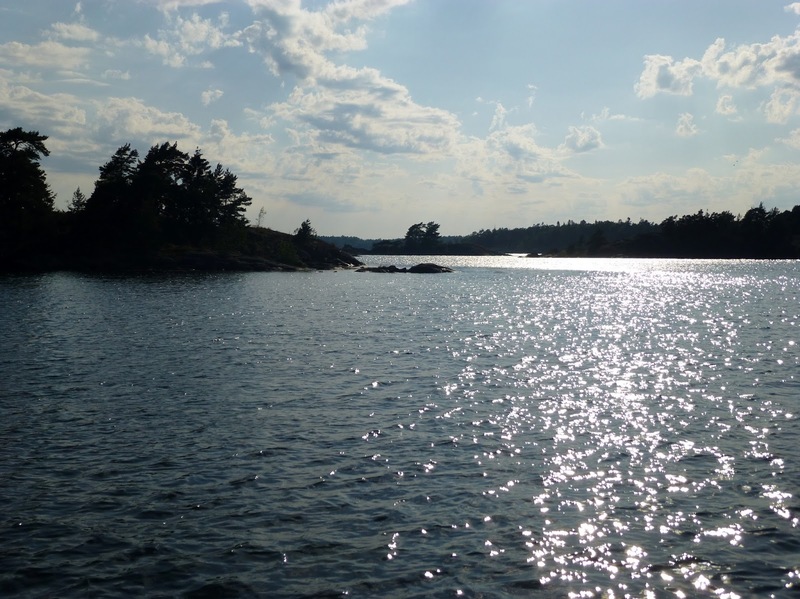 We had arrived in Vastervik, a provincial seaside town five hours to the south of Stockholm, and the temporary mooring place of our boat. Cold, wet and windy, we were marooned there for a couple of days waiting for the weather to change, giving me plenty of time to hit the summer sales. New pillows and duvets arrived on the boat, together with bright duvet covers, cushion covers and a small blue and white cotton rug that neatly fits both in the saloon and the cockpit and which I cannot now image being without. Citronella tea-lights glow in colourful glass holders in the evenings, deterring mosquitoes and adding to the ambiance - mosquitoes are ubiquitous when living on the water and being confined with one for the night in a very small space is to be avoided at all costs! Anxious to avoid yet more shopping, he insisted we set out as soon as the weather improved, heading north towards the Stockholm archipelago and completely different way to see Sweden!